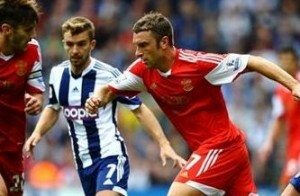 Rickie Lambert capped off a dream week with a penalty a minute from time to give Southampton a 1-0 win over West Bromwich Albion at the Hawthorns. Lambert, who scored the winner for England in midweek against Scotland, smashed home a spot-kick after Luke Shaw was tripped in the box by Youssouf Mulumbu. The Saints deserved their victory after dominating the game. Skipper Adam Lallana had a goal ruled out in the first-half for off-side after tapping in a flick on from Lambert. Replays showed that Lallana may have been level when he slotted in from a yard out. Saints also hit the woodwork through Rodriguez with a fizzing volley from just inside the area after a poor Albion clearance. Steve Clarke’s side had little to show from their efforts aside from a late Billy Jones header which was brilliantly kept out by Artur Boruc.